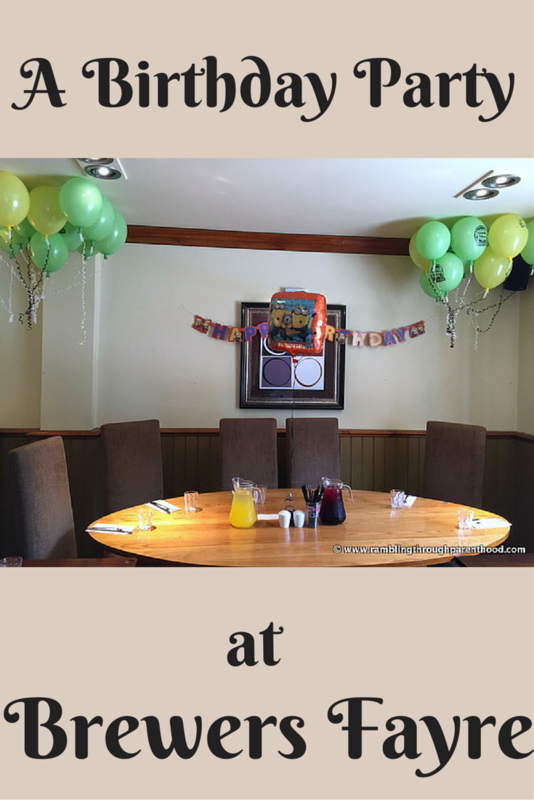 I knew Brewers Fayre did birthday parties because J had been invited to one last year. So when the time came to select a venue for J’s fourth birthday, the only dilemma facing us was which Brewers Fayre to book. We have a couple near us, you see. One of them has undergone a recent refurbishment and hosts a large Fun Factory, a dedicated children’s play area. The other one has a smaller Play Zone, but with the advantage that it is open to the restaurant seating area. The glass screen on one side also means parents can keep an eye on proceedings while enjoying their meal. When offered the choice of venues, J chose the one with the Play Zone. Not surprising given that it was familiar territory. (We do visit this particular Brewers Fayre quite often, recently during May half-term). Venue and time decided, it was now left to us to collaborate with the team to ensure that J had the most wonderful birthday ever. Brewers Fayre allocated a dedicated host to help us. Selena and her team were absolutely wonderful. They went out of their way to help with the planning and execution of the party, offering suggestions and always open to ideas. The decision was made to reserve one area of the restaurant for our party. The furniture would be rearranged to accommodate a bunch of exuberant four year olds. Their parents would sit overlooking the soft-play area to help monitor the unruly bunch. I decided to pre-order from the delicious Brewers Fayre menu. It would save us all trouble on the day. J’s guests were all very excited to find out they would be having a three-course sit down meal. I was soon inundated with preferences. Of all the things on offer, jelly and ice-cream was most popular. 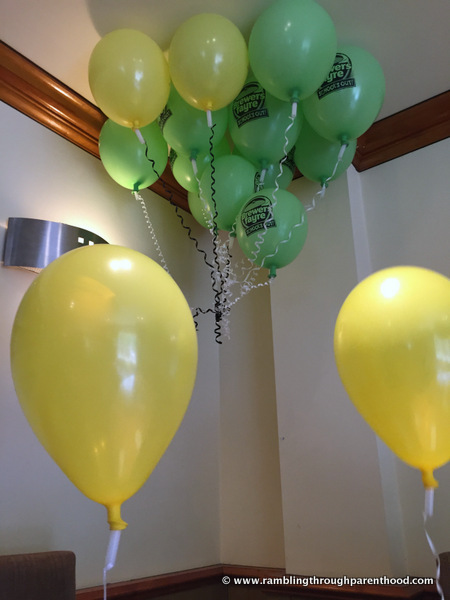 A couple of days before the party, I got in touch with the Brewers Fayre team to hand over some party decorations and the pre-order. Brewers Fayre use Dennis as their mascot, so all their stuff is Dennis-based. But J wanted Minions for his party. We decided to do a mix-and-match party theme. We were to have Minions and Dennis working together on the day! J was so excited and looking forward to his birthday party. I was a bit anxious, having never marshalled a dozen and half excitable four year olds before. The lot of them did brilliantly well on the day. They started off expending energy in the soft-play area, stopping occasionally to grab a well-deserved orange or blackcurrant drink. The kids then sat down to their three-course meal, where they tucked into some amazing food. I know it was delicious because I managed to nibble on leftovers from J’s plate. A few other parents followed suite with their kids’ meals and concurred on the food quality. It was back to running around in the soft-play area before settling down to sing ‘Happy Birthday’ as J blew the candles on his cake. It was time to go home, but not before collecting party bags. These too were a mix of Minions and Brewers Fayre fayre. There were Dennis balloons and colouring books to take away in addition to the other goodies and a slice of cake. J’s birthday party lived up to all my expectations and beyond. Everyone had a fantastic time and the staff at Brewers Fayre were on hand every step of the way to make sure things went smoothly. Would I choose to host another party at our local Brewers Fayre? Friendly and helpful staff, a decent children’s play area and amazing food all in one place. It’s a no-brainer, really! Disclaimer: We were offered vouchers to use at Brewers Fayre for the purpose of this review. All opinions are my own. Ha ha ha! The kids didn't seem to mind. Ha I noticed the beans too. We have never been to a brewers fair, I actually worry at how much people spend on kids parties now! My nephew has had his party at Brewer's Fayre two years running because my sister in law was so impressed with the set up. I'm glad that J enjoyed his birthday party, it does look like it was fun. I've never had a party for any of my children at a venue like this before, I choose to wear myself out by hosting them at home...at least you didn't have to do the washing up! I do like our local Brewer's Fayre and can't wait until we have our refurb. Glad the party went well. I've never had a party for my son as he wouldn't be able to manage it which is a shame when I see parties like this. Looks very handy for parents as I know arranging them can get a little out of hand these days. This sounds like a great party and very convenient. Love the cake! It looks great, I may have to consider this for Leo's birthday next year! wow what a lot of fun. we love brewers fair ours has a massive play area that has just been redone. what a great place for a party. I'm loving that cake! This looks like the perfect location for a children's party! !